A recent study shows that YouTube is responsible for nearly 10% of all Internet traffic. As a result of the increased popularity of YouTube and other video streaming sites, HTTP traffic now generates more traffic than P2P, for the first time since 2002. The data gathered by Ellacoya, a company that offers broadband service optimization solutions for IP networks, shows that 46% of all Internet traffic is generated by HTTP traffic, compared to 37% by P2P. In comparison, two years ago, 65% of all the data sent over the Internet was P2P related. However, that soon changed after the big boom of video streaming services. Unfortunately there is no data on the total growth of Internet traffic, but it is likely that P2P traffic is still growing, only not relative to HTTP traffic. 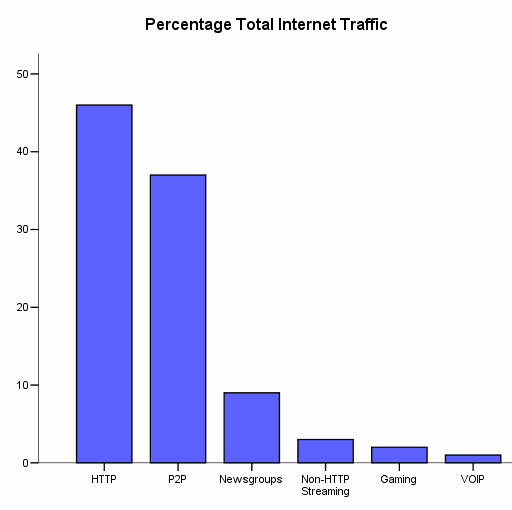 A breakdown of the HTTP traffic reveals that audio and video streaming represents 41% of the HTTP traffic, half of that is caused by YouTube. Text and images from web pages are still using a bit more bandwidth (46%), but this wont be for long. Interestingly, newsgroups only account for 9% of the total traffic, but are treated as a separate category in Ellacoya’s report. However, most of the data shared on newsgroups can be categorized as peer-to-peer traffic, in this case both HTTP and P2P will be responsible for 46%. Gaming, Voip and non HTTP video streaming fill up the gaps with 2%, 1% and 3% respectively. The total volume of bandwidth that people consume will probably continue to grow in the years to come. New streaming services, and Internet based TV project such as Joost will require massive amounts of bandwidth. Also, BitTorrent is still gaining popularity, earlier this week we reported that Mininova is still growing at a rapid pace, they served 1 billion downloads in less than 6 months. Let’s hope the pipes won’t clutter. c There are 7 comments. Add yours?